When my brothers [Frank and Jack Lilley] arrived in Pyongyang [in 1934 and 1935], they found it larger than Tsingtao, with several six- and eight-story buildings and many taxis and streetcars, but it was a gritty, gray city under the heel of Japanese occupation. In Tsingtao we were still somewhat unaware of Japan's intentions in China, but Frank kept us clued in from his vantage point in Korea, which Japan had annexed in 1910 and which was closer to the center of Japanese military activity in northeast Asia. Frank sensed impending war from his reading of the local papers and his observations of the Japanese military in Korea, and he conveyed his thoughts to us in Tsingtao every week in his letters. Indeed, at school he and the other students were often very close to demonstrations of Japanese military might. Across the river from PYFS [Pyeng Yang Foreign School], the Japanese had their major military airfield in Korea. Several times a week during classes, Japanese dive-bombers executed dry runs over the school, aiming for the school's athletic fields as the target for their imaginary payloads. Then, at night, searchlights would light up the sky over Pyongyang for night runs, and students would run to black out their windows. By the time Frank got to Pyongyang, the Japanese were turning their tactics of intimidation on the local community of Western missionaries. In January 1935, Japanese authorities called down two American missionaries, Samuel Moffet, the pioneer Western missionary in Korea, and Dr. Douglas McCune, head of Union Christian College. The Japanese demanded that the missionaries follow Japanese custom and force the Korean students at their schools to pay homage to the Japanese emperor at the city's Shinto shrine. The missionaries refused. The Japanese threatened to close the Christian schools in retaliation. UPDATE: The bit about white clothes being a protest doesn't sound right to Kotaji, either (see comments). He concludes, "Anyway, the point is that I've never heard of wearing white clothes as a form of protest, but it might just be that the Japanese found Koreans wearing their traditional clothing offensive." I suspect this might illustrate a weakness of Lilley's book: garbled memories not carefully cross-checked against external sources. Perhaps it even illustrates the frequently criticized CIA habit of trusting secret informants while mistrusting open sources, publicly available information. Japan's Liberal Democratic Party won so many Diet seats in the recent election that they had to exhaust their proportional representation lists in the Kanto area. A gushy, 26-year-old political novice was one of the lucky beneficiaries. And now he's catching a lot of flak from his new colleagues for gawking publicly at all his new perks. Mainichi Shimbun has more. According to Shukan Bunshun (9/29), the former brokerage worker's entrance into politics was inspired by, in his own words, "a yearning like girls have to become idol singers." Sugimura promptly whipped out an essay in about half an hour, faxed off an application form and received an endorsement certificate from the ruling party, which he proudly boasted would become a family heirloom for centuries. When Sugimura was listed in 35th position on the LDP's proportional representation ticket for the Minami Kanto block, nobody dreamed he'd actually get into office. Sugimura told reporters his campaign consisted of a single speech and he had no campaign office or posters. But the LDP won the election in a landslide, carrying 26 of those listed above him to single-seat victories, which raised Sugimura further and further up the LDP ticket and gave him the seat that sparked such excitement for both him and reporters. But, all good things must come to an end. Though Sugimura can be comforted in the knowledge that, until the next election at least, he's going to be showered with a whole truckload of creature comforts, LDP honchos are furious at his over-enthusiastic reaction to becoming a member of the government. LDP Secretary General Tsutomu Takebe has issued a strict order to Sugimura to "shut up." Hirohito: Obsessed with His Past? Hirohito's European and American visits [in 1971 and 1975, respectively], together with his various press interviews, helped the Japanese people to reengage with the long-buried question of his war responsibility. But for Hirohito the foreign tours and the interviews had no such effect. For him, the event that triggered a confrontation with the past was more personal. Certain reminiscences on the war by his brother, Prince Takamatsu, had appeared in the February 1975 issue of the popular journal Bungei shunjû. Hirohito seems not to have learned about the article until January 1976. Interviewed on the war by journalist Kase Hideaki, Prince Takamatsu implied that he had been a dove and Hirohito a reckless hawk. He told of the incident on November 30, 1941, when he had spoken to his brother for five minutes, warning him that the navy high command could feel confident only if the war lasted no longer than two years. Takamatsu also recalled warning his brother to end the war right after the Battle of Midway. And he told how, in June 1944, he had shocked a meeting of staff officers at Navy General Headquarters by telling them that "Since the absolute defense perimeter has already been destroyed ... our goal should be to focus on the best way to lose the war." Finally, Takamatsu revealed that he and Prince Konoe had considered asking the emperor to abdicate prior to surrender. Learning of these disclosures, Hirohito grew very upset. He felt his brother had gone too far. What could he do to save his reputation as emperor? For the first time since he dictated his "Monologue" and, with Inada Shûichi and Kinoshito Michio, made the first "Record of the Emperor's Conversations" (Haichôroku), Hirohito returned to the task of setting the historical record straight. The project to record the events of his reign and define the place that he would occupy in history focused on his role during the years of war and occupation. It quickly turned into a consuming interest that haunted him for the rest of his life. By nature the least self-reflective of men, Hirohito became obsessed with his past. On September 20, 1947, Hirohito conveyed to MacArthur's political adviser, William J. Sebald, his position on the future of Okinawa. Acting through Terasaki, his interpreter and frequent liaison with high GHQ officials, the emperor requested that, in view of the worsening confrontation between the Soviet Union and the United States, the American military occupation of Okinawa and other islands in the Ryukyu chain continue for ninety-nine years. Hirohito knew MacArthur's latest views on the status of Okinawa when he made this offer. [MacArthur had been quoted as saying, "The Ryukyus are our natural frontier" and "the Okinawans are not Japanese."] The emperor's thinking on Okinawa was also fully in tune with the colonial mentality of Japan's mainstream conservative political elites, who, like the national in general, had never undergone decolonization. Back in December 1945, the Eighty-ninth Imperial Diet had abolished the voting rights of the people of Okinawa along with those of the former Japanese colonies of Taiwan and Korea. Thus, when the Ninetieth Imperial Diet had met in 1946 to accept the new "peace" constitution, not a single representative of Okinawa was present. I haven't lately been checking as many non-Asia blogs as I used to before spending the past two months in Japan, but now that I have to get back to my workplace, I've started to broaden my horizens a bit more. Today I checked in with a favorite history blog, Rhine River, where I found a post that really struck me, as a person of rural white Southern heritage (with a daughter in college in Connecticut). Connecticut's leading newspaper has been running an enlightening series that still resonates today. Kudos to the Hartford Courant. Mark Twain would be proud. Here's a bit of what Nathanael quotes. Connecticut became an economic powerhouse in the 18th century, far out of proportion to its tiny size, because we grew and shipped food to help feed millions of slaves, in the West Indies. The rivers and streams of Connecticut in the 19th century were crowded with more than a hundred textile mills that relied on cotton grown by hundreds of thousands of slaves, in the South. Up to the edge of the 20th century, two towns on the Connecticut River were a national center for ivory production, milling hundreds of thousands of tons of elephant tusks procured through the enslavement or death of more than a million people, in Africa. All of the benefits and none of the screams. Recently, we set out from Ashikaga for 大泉 Ôizumi, Japan's "Little Brazil" in neighboring Gunma Prefecture's fanhandle to our southwest. At 太田 Ota ('Widefield'), we transferred to a 2-car, 2-stop, infrequent shuttle train running back toward the southeast to Higashi Koizumi ('East Littlespring'). There we had to transfer to yet another 2-car, 2-stop, infrequent shuttle train running back southwest to the end of the track at Nishi Koizumi ('West Littlespring'). The fare adjustment official at Ota described Nishi Koizumi as the most bustling (にぎやか) of the three Littlesprings (East, Middle, and West) that make up Bigspring. Well, wherever the bustle was, we didn't see it. The tracks ended where the single platform ended at Nishi Koizumi. We walked straight south from the train station, crossed over a highway busy enough to warrant a pedestrian overpass, past a small fountain (maybe the 'littlespring' itself) that marked the beginning of a very long and pleasant walkway and bikepath (the Izumi 緑道 'Greenway') shaded by a great variety of trees and bushes, most of them labeled, so that I repeatedly stopped to punch the katakana names into my little electronic dictionary to find the English equivalents. To our right ran the kilometer-long fence punctuated by gated driveways enclosing a quiet but huge Sanyo electronics factory. To our left ran sleepy Hanamizuki-dori 'Dogwood Avenue', which hosted occasional trucks and vans making deliveries. Hardly anyone but a few stressed-out middle managers was making use of the jogging path. Across the road were a variety of smaller enterprises: a few stores, a few restaurants, and a preschool teacher-training school followed by Santa Clara (聖クララ) preschool. The name of the school and the distant sounds of Portuguese rather than Japanese coming from its parking lot were among the few signs of the town's large Brazilian population. Other clues were: a cardboard sign next the train ticket vending machine at the station that listed all the destinations in a Portuguese-friendly transcription; a small shop near the station that sold goods imported from Brazil, Peru, and Bolivia; and the Primavera Restaurant, which we noted for our return. It was nearing lunchtime. Primavera was an interesting oasis, like a midwestern truck stop in many ways. The kitchen help spoke mostly Japanese, the customers spoke mostly Portuguese, and the menus and wait help were bilingual in Japanese and Portuguese. The music was mostly Country & Western in style, but with the lyrics in Portuguese. The featured buffet (バイキング [Viking] = smorgasbord) was discounted from ¥1600 to ¥1000 because it had run out of most of the grilled meats--and also the feijoada, I discovered after I ordered it. My wife went for just the salad bar portion. 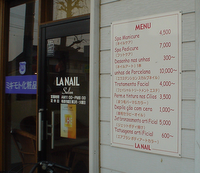 At the register, I asked the European-looking owner (in Japanese) how long he had been in Japan. He said 2 years this time, but 5 years in all. (Nikkei Brazilians can easily get work visas for 3-year stints.) His soft-spoken Japanese was even more limited than mine. He estimated the local population was at least 10% Brazilian, maybe 15%. On our way back to the station, we stopped in at the small import shop, whose owner greeted all his customers with "Tudo bem?" --followed by "Konnichi wa!" if they looked Japanese. He looked to be Nikkei, and his Japanese was very fluent. He said he had been in Japan 7 years in all. He said the local population was 15% Latin American, with 10% from Brazil alone. When we got back to the sleepy station, we found that we had a 45-minute wait until the next train, so we east headed down the line of shops beside the main highway (National Route 354), finding nothing at all. When we stopped to ask, we were directed to the Mos Burger, with its American southwestern decor, and sipped our tall ice coffees until it was time for the zigzag sequence of short train hops back home. There are no doubt many North American equivalents of Nishi Koizumi, but it reminded me of the hidden charm and factory-sequestered bustle of an Austin, Minnesota--the Hormel company town that hosts the Spam Museum--especially if Austin had a little larger Hispanic population. Brigadier General Fellers had joined MacArthur's Southwest Pacific Command in Australia in late 1943, after having worked for a year in the Office of Strategic Services (OSS), predecessor of the CIA. Immediately on landing in Japan (in the same plane that carried MacArthur), Fellers went to work to protect Hirohito from the role he had played during and at the end of the war. Fellers's overriding goals were to confirm the effectiveness of his own wartime propaganda program, and, at the same time, to shield Hirohito from standing trial. MacArthur's truly extraordinary measures to save Hirohito from trial as a war criminal had a lasting and profoundly distorting impact on Japanese understanding of the lost war. The Indian appointee to the [Tokyo war crimes] court was sixty-year-old Radhabinod Pal of the High Court of Calcutta. Pal had been a supporter of the pro-Axis Indian nationalist, Chandra Bose, and a longtime Japanophile. Unlike most Indian elites, who condemned both British and Japanese imperialism and never embraced the ideology of the Greater East Asia Coprosperity Sphere, Pal was an outright apologist for Japanese imperialism. Arriving in Tokyo in May, he accepted his appointment under the charter in bad faith, not believing in the right of the Allies to try Japan, let alone judicially sanction it any way. Determined to see the tribunal fail from the outset, Pal intended to write a separate dissenting opinion no matter what the other judges ruled. Not surprisingly he refused to sign a "joint affirmation to administer justice fairly." Thereafter, according to the estimate of defense lawyer Owen Cunningham, Pal absented himself for 109 of 466 "judge days," or more than twice the number of the next highest absentee, the president of the tribunal, Sir William Webb himself (53 "judge days"). Whenever Pal appeared in court, he unfailingly bowed to the defendants, whom he regarded as men who had initiated the liberation of Asia. Pal, the most politically independent of the judges, refused to let Allied political concerns and purposes, let alone the charter, influence his judgment in any way. He would produce the tribunal's most emotionally charged, political judgment. Many who repudiate the Tokyo trial while clinging to the wartime propaganda view of the "War of Greater East Asia," believed that the main cause of Asian suffering was Western white men--that is, Pal's "victors." They would cite Pal's arguments approvingly. So too would others who saw the war primarily in terms of the "white" exploitation of Asia. I was going to post something about the wasteland that is Japanese network television, but Jeff at Conbinibento has captured it much better than I could. I just have one tiny correction: Males are more likely to exclaim "UMAI!" instead of "OISHII!!!" And one minor addition: NHK's lecture channel (Ch. 2 in my area), where a professorial talking head addresses his (sometimes her) dry monologue at the camera hour after snoring hour. Ask Japanese speakers on the street today if they know what keigo is, and the answer will be a resounding yes. A hundred years ago, the response is more likely to have been no, or at the very least, "What?" The word "keigo" was invented by Meiji scholars to describe something that presumably already existed but had never been named. Along with that naming came keigo ideology. In some sense keigo is a modern construct that serves an important ideological function. Its contemporary identity is a product of historical processes that begin in what I call the "Big Bang" of keigo ideology: kokugo seisaku 'language policy', which began with the Kokugo Chôsa Iinkai of 1902. If keigo ideology did not exist before Meiji, how did it come to exist today? What was the cloud of raw materials out of which it formed? What stages has it passed through? How is its contemporary shape different from the primordial mass from which it emanated? And how did it happen that the primordial mass has passed from a timeless state of perfection to a state of decline? If one presses modern Japanese speakers to talk a little more about keigo, they will probably indicate that it is an important component of what it means to function as an adult in society, that they wish they could use it more skillfully, or that they wish the younger generation could use it more skillfully--that keigo today is midarete iru 'in a state of disarray'. They will talk about keigo in terms of the social fabric within which it functions. Their views are echoed and elaborated in a self-help, "how-to" genre. Keigo how-to takes its place alongside other kinds of Japanese how-to, and makes use of the same images, the same constructs, and the same view of the Japanese cultural landscape as do other kinds of how-to in Japan. Within this early occupation period [from September 1945], MacArthur's "military secretary" and former head of psychological warfare operations, Brig. Gen. Bonner F. Fellers, reestablished personal ties with two Japanese Quakers. One, Isshiki (Watanabe) Yuri, he had known from his days at Earlham College in Richmond, Indiana; the other, Kawai Michi, a former secretary-general of the YWCA and founder in 1929 of Keisen Girls School in Tokyo, he had met on his first visit to Japan in 1920. During their initial reunion meetings, Fellers spoke frankly of his urgent concern to prove that no grounds existed for holding the emperor responsible for the Pearl Harbor attack. With Kawai acting as his consultant and collaborator, Fellers was soon put into contact with her acquaintance, Sekiya Teizaburô, the high palace official who, since late Taishô, had played a leading role as a liaison between the court and government ministries. Sekiya too wanted to prove that the emperor was a "lover of peace." Between April and July 1945, MacArthur and Fellers had worked out their own approach to occupying and reforming Japan. In their view the principles of psychological warfare that Fellers had implemented in the Battle of the Philippines and elsewhere were solidly correct. They had played a key role in lowering Japanese morale, hastening surrender, and preparing the Japanese for occupation. Japanese military leaders alone bore responsibility for the war, and the emperor, the "moderates" around the throne, and the people had been totally deceived by them. All Japanese trusted the emperor. U.S. psychological warfare should build on their trust and turn it against them. These ideas, the "common sense" of American psychological warfare experts in the Pacific, not to mention Chinese and Japanese Communist leaders in North China, had become MacArthur's fixed principles and were woven into his initial occupation plan. Code-named Operation Blacklist, the plan turned on separating Hirohito from the militarists, retaining him as a constitutional monarch but only as a figurehead, and using him to bring about a great spiritual transformation of the Japanese people. Because retaining the emperor was crucial to ensuring control over the population, the occupation forces aimed to immunize him from war responsibility, never debase him or demean his authority, and at the same time make maximum use of existing Japanese government organizations. MacArthur, in short, formulated no new policy toward the emperor; he merely continued the one in effect during the last year of the Pacific war, then drew out its implications as circumstances changed. (2) Early June 1945, "when the showdown Battle of Okinawa had been lost, when government analyses indicated that the war effort could soon continue no longer, and when General Umezu unveiled for the emperor the bleak results of his personal survey of the situation in China"
Their third missed opportunity was July 27-28, when the Potsdam Declaration arrived and the Suzuki cabinet, after careful deliberation, twice publicly rejected it. At the time no member of the "peace faction" came forward with a proposal for accepting the Potsdam terms. Pinning their hopes on Konoe's not-yet-arranged mission to Moscow, the emperor and Kido [lord keeper of the privy seal, his closest advisor] waited and waited for a response from Moscow--a response that Ambassador Satô and others repeatedly stated would never come. Only after Hiroshima had been bombed did the emperor say, "We must bow to the inevitable;" now "is a good chance to end the war." More than ten thousand Japanese people died from conventional air raids during this eleven-day interval. The Japanese "peace" overtures to the Soviets, which had followed Germany's capitulation, were vague, feeble, and counterproductive. They certainly never constituted a serious attempt to negotiate an end to the war. The thinking behind those maneuvers never progressed beyond decisions reached by the inner cabinet in mid-May 1945. As Konoe rightly suspected it would, the emperor's attempt to end the war via Moscow turned out to be a complete waste of time, and amounted to an imperial decision to postpone facing reality. Did the U.S. also miss an opportunity by continuing to insist on unconditional surrender? Here's what Bix has to say (p. 518). If the conservative [former ambassador to Japan] Joseph C. Grew and the "Japan crowd" had gotten their way and the principle of unconditional surrender had been modified in advance, it is highly unlikely that Japan's postsurrender leaders, now the "moderates" around the throne, would ever have discarded the Meiji constitution and democratized their political institutions. Grew and those who took his position had very little understanding of the Japanese body politic, no faith in the capacity for democracy of ordinary Japanese people, and certainly no desire whatsoever to see the social foundations of the monarchy dismantled. Britain's reponse to the Axis military alliance was to reopen the Burma Road, which earlier it had agreed to close, and to look for ways "to cause inconvenience to the Japanese without ceasing to be polite." President Roosevelt's response was to make another small loan to Chiang Kai-shek, and give assurances of further American support to keep China in the war. In November, Roosevelt assented to Adm. Harold Stark's "Dog" plan for the recasting of America's defense strategy on the premise that Germany was the main enemy. Henceforth the United States would follow a defeat-Germany-first strategy, focusing on the European front and aid to Britain. If war should come in the Pacific, the United States would initially wage a defensive campaign but not turn its full weight against Japan until after Germany's downfall. In China, Chiang Kai-shek resolved to continue fighting Japan alone, without benefit of full-scale Anglo-American aid, but confident that war in the Pacific was only a matter of time. The sample issue of Singapore University Press's new China: An International Journal, now in Project Muse, has an interesting article by Wayne Bert about different attitudes toward separatism in China and Canada. Here's the conclusion (minus footnotes). The level of modernisation, commitment to democracy and particular historical and cultural experiences can explain the divergent Chinese and Canadian attitudes on separatist territories. Whereas Canada has acclimatised to living next to its superpower neighbour, absorbed the values of a virtual state and discarded the traditional expectations of the importance of territory, China is a rising power with an acute sense of grievance from the way it has been treated historically, or at least the way it perceives it has been treated. This strong inferiority complex has stimulated an intense desire to do something about what many Chinese believe is their misfortune, to occupy an international position that conforms to traditional power politics and emphasises the value of territory. Canada's attitude is reinforced by its commitment to democracy and interdependence, and to the granting of the wishes of the people of Quebec, whatever they may be. The Chinese, on the contrary, lacking both a commitment to democracy and self-determination or the status of a developed state, view Taiwan not as an area containing a population that should have some say in how they are governed, but as a geopolitical object to be manipulated to maximise the glories of a greater China. The gulf between the norms and conventions regarding democracy and self-determination held respectively by the West and China show few signs of disappearing. The figurative combat over Taiwan will continue, since each side in the dispute "has reached its bottom line" and is not interested in serious negotiation. If the conflict can be kept rhetorical rather than military, it will be a major accomplishment. Meanwhile, the Canadians will eventually reconcile their differences, either in the short- or long-run, either raucously, or quietly, but almost certainly, peacefully. The slavish Chinese commitment to the very Western concept of sovereignty fits well with a realist's definition of the international system, albeit a system more closely aligned with the 19th century than with the 20th. The Chinese view of the world, however, is one that very slowly, but surely, is being replaced by a view more akin to the world of interdependence and industrialised democracies. While Canada may represent an extreme view on the question of secession, even in the West, it is one that is gaining ground as the culture and objectives of the virtual state become increasingly dominant. Other Western countries still have their minorities and groups demanding independence, but increasingly it is being realised in the developed world, that some kind of concessions must be made for either autonomy or secession in democracies. It is the developed world that is transforming the international system, which in turn puts pressure on other states and institutions to adopt more modern attitudes and structures. Even Indonesia, a relatively poor and fledgling democracy, has taken big strides in that direction since 1998 even in the face of nationalist counter-pressures. It has wisely granted independence to East Timor and offered greater autonomy to regions. In its pre-democratic period, it had long resisted compromise on East Timor. So far there is little evidence, however, that the Chinese intend to follow suit. Their stance on Taiwan continues to be intractable, in the face of plenty of evidence that the majority of the Taiwanese have little interest in de facto, or even de jure, joining the Mainland. The main hope for resolution of the Taiwan problem is the fashioning of some kind of face-saving deal that will allow China to claim Taiwan while guaranteeing the people there that this will have no effect on their lives. The prospects of effecting such a feat will grow increasingly remote unless major changes take place in the PRC. Lacking such developments, the Strait of Taiwan will be volatile for years to come. Ota itself is quite an international town. 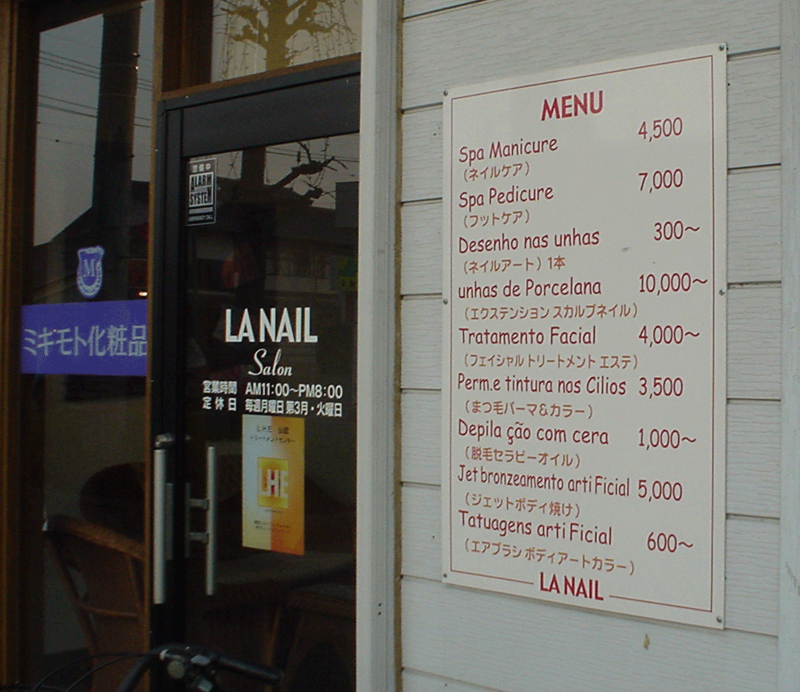 The neighboring town [Ôizumi] has one of the largest Brazilian populations in Japan. Ota itself has one of the largest Asian communities outside of Tokyo. 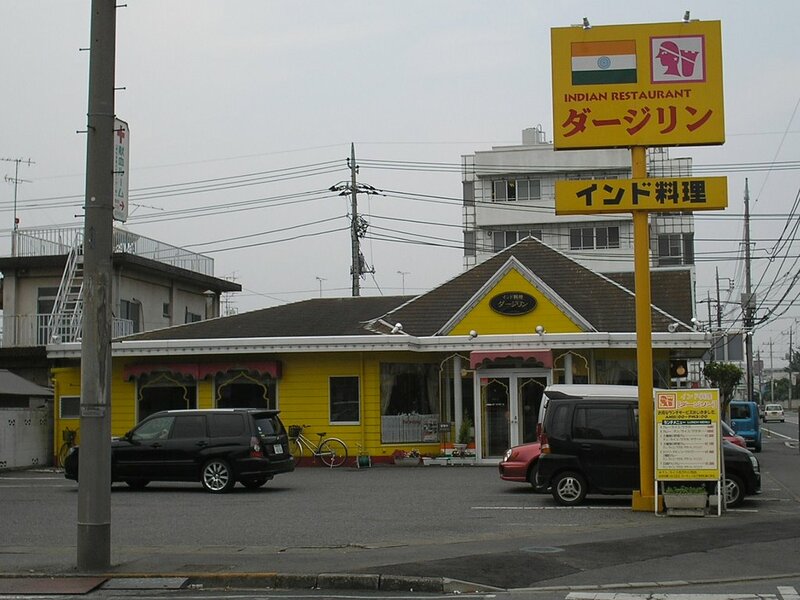 This means that, as well as all the usual non-Japanese restaurants (Italian, French, Chinese) there are many Indian, Pakistani and Brazilian restaurants a short walk or drive from the school. Purdue University's The Exponent Online is rather more modest when it compares Ota City to Lafayette, Indiana. The populations are almost the same, both cities were changed from agricultural centers to industrial centers, both cities are on a river, and for the most part, both are flat cities. What moved a Purdue student reporter to compare Lafayette and Ota? Well, West Lafayette, Indiana, is home to Purdue's main campus as well as to Subaru-Indiana Automotive, Inc. Fuji Heavy Industries and Subaru are among the largest employers in Ota, a commercial cluster development center dating back to the days of textiles and then military aircraft. After the trail went cold in that direction, we headed back for the station on a main drag with more vehicle traffic. It was a much more family-oriented strip mall, with a huge shopping center, and plenty of parking, car dealers, tire shops, and the most amazing site entirely dedicated to weddings that I've yet seen, the Royal Chester Ota (for "The Brilliant European Wedding"). (Again, I've never been to Las Vegas.) We saw plenty of chain restaurants, but nothing representative of Ota City's large foreign community. We couldn't find a clue until a couple hours later when, after circling a few blocks north of the station, we asked at Rana, an "International, Halal" food store run by some Iranians. The only other customer was a Nepali who not only owned an Indian restaurant named Darjeeling, but offered to drive us there, and even to drive us back to the station if his place wasn't too busy by the time we finished eating. We readily accepted, and had a wonderful meal of chicken tandoori, mutton masala, nan bread, and salad vegetables, washed down with a couple of beers unusual for Japan: Everest and Grolsch. The proprietor came to Japan ten years ago, and his restaurant has been successful enough for his elder brother to open a branch in Tokyo. Except for a few words of English, he and I communicated entirely in Japanese, quite informally and comfortably. Neither of us had done enough formal study to command formal registers very well anyway. After dinner, we insisted on walking back to the train station, and he came out to the street to confirm his earlier directions and we parted in typical Japanese fashion, with bows and thank yous. On the way back, we passed the Civic Center, with a range of social support facilities for both citizens and foreigners, including an office that handled passports and visas. The 1 May 2005 issue of Pakistan's Dawn has more about unskilled foreign workers in Ota. Kimio Matsudaira, an official at Hello Work, a public labour office in Ota city, Gumma prefecture, 60 kilometres north of Tokyo, said there is now a special programme to help and support foreigners working in the area. Ota has a population of about 200,000 people. The irony is that more than sixty per cent of its people are over 60 years of age, in a city where the economy is dependent on manufacturing. Without doubt, Ota really needs foreign workers badly. To support the city’s automobile and electronic industries, Ota is now host to more than 30,000 Japanese Latin Americans, descendants of Japanese who emigrated to South America in the early 20th century seeking a better future. In the late eighties Japan launched a policy of accepting third and fourth generation Japanese Latin Americans to support a labour shortage in its factories stemming from the bubble economy at that time. More recently, Asians, mostly from South-east Asia, have also arrived to work in factories, comprising a total of 45,000 registered workers in Ota city. Matsudaira said foreign workers are vital to the survival of Ota’s economy. Kiryu (桐生), in Gunma Prefecture's southeast fanhandle, was an early center of silk manufacture, a later pioneer in textile manufacturing, and now home to Gunma University's Faculty of Engineering, which offers this glimpse at its industrial transitions. Kiryu is often referred to as "the Eastern Kyoto". Like Kyoto, Kiryu has over 1,000 years of history behind it and owes its wealth and tradition to the silk textile industry. Even now, Kiryu is a major centre for the manufacture of kimonos (traditional Japanese wear). The precise origins of the silk industry in Kiryu have been lost in the mists of time, but according to local legend a young man from Kiryu won the heart of a princess at the Imperial Court in Kyoto with his exquisite poetry. They eventually married and returned to Kiryu, where she taught the local inhabitants the art of weaving. There are records of silk production in Kiryu dating from the 10th century. 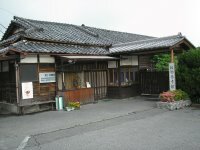 Over the years, the silk industry grew and flourished in Kiryu. Kiryu silk was sent to the Imperial Court and was used by the Tokugawa Shogun for his army's battle banners in 1600. Kiryu became the site for a major silk market which drew merchants from all over Japan. However, in recent years the kimono was been largely replaced by Western-style suits and dresses. The golden age of the silk industry has now passed. An article by Tomoko HASHINO entitled "Power-looms and the factory system: the relation between production systems and technology choice in the silk textile industry in Kiryu in the 1910s" has more about the early transition from hand looms to power looms. The abstract from Socio-Economic History, vol. 63, no. 4, follows. Recent studies have clarified some special features regarding the introduction of power-looms, especially in pre-war Japan. One of the more important findings was the close relationship between particular production systems and technologies, for example the factory system and power-looms and the putting-out system and hand-looms. The purpose of this paper is to investigate the above relationship in the silk textile industry on the basis of the hypothesis that the factors leading to the introduction of power-looms are independent from those leading to the introduction of the factory system. Kiryu is one of the oldest silk textile industry districts in Japan. In the early Meiji period (1870s-80s) it showed a positive response to the introduction of new foreign technology, such as the batten and the Jacquard machine, and helped to spread them to other areas. But Kiryu was slower than other areas in introducing power- looms. The putting-out system was widely adopted in Kiryu and had a long history. It has been assumed that this acted as an obstacle to the introduction of power-looms. In the 1910s, there were four types of factory in Kiryu: factories with power-looms only, factories with hand-looms only, those with both, and those with none, which were often called orimoto (clothiers). Neither the production systems nor the technology dramatically changed in Kiryu in the 1910s; however, some factories began to introduce power-looms. There were some reasons that promoted the adoption of the factory system. OJT (on-the-job-training), which played a role in maintaining the quality of goods, was an important reason in Kiryu in the 1910s. As past studies point out, institutional, technological and market factors were other reasons that promoted the introduction of power-looms there. While both electrification and the establishment of domestic and local power-loom suppliers were very important, it appears that the change in raw material from raw silk to rayon in the 1920s was the decisive factor in accelerating mechanization. The fact that hand-loom factories have often been categorized as "manufacture" has been a controversial issue among historians. But we must recognize the significance of their role in controlling workers and turning them into a skilled labor force. During my later elementary school years in Kyoto, I used to come home from school and watch sumo matches on our new black-and-white television (Sharp-brand, if I recall correctly). At that time, my favorite wrestlers were Taiho and Asashio, the latter a bit hairy, muscular, and not very fat. (Wakachichibu was the fattest one at the time.) I knew Taiho hailed from Hokkaido, but didn't know that he was born on Sakhalin of mixed Japanese and Russian parentage. This week has been the first time since childhood that I've had the chance to watch a sumo tournament unfold in real time. The first day of the current Aki Basho ended with a dramatic upset, as newly promoted komusubi Futeno caused a blizzard of zabutons to fly toward the ring by defeating the domineering yokozuna Asashoryu. Grand champion Asashoryu overwhelmed Kakizoe on Thursday, while Bulgarian Kotooshu claimed the sole lead at the Autumn Grand Sumo Tournament. Mongolian Asashoryu was all business in the day's final bout at Tokyo's Ryogoku Kokugikan when he deployed several powerful arm thrusts to send the No. 2 maegashira over the straw ridge. Asashoryu, who is gunning for his sixth straight Emperor's Cup, won his fourth straight bout and improved to 4-1 while Kakizoe dropped to 1-4. Sekiwake debutante Kotooshu continued his impressive form when he swatted down top maegashira Miyabiyama to remain undefeated and in the lead at 5-0. Miyabiyama, who was no match for the lanky Bulgarian, dropped to an unflattering 1-4. There are also two Russian rikishi in this basho, but the Bulgarian is the one to watch (not to mention easier on the eyes). And his demeanor at this point is far classier than that of Asashoryu, who tends to glare defiantly and even pump his fist in triumph after each win. UPDATE, Day 8: "Kotooshu large and in charge"
Bulgarian sekiwake Kotooshu continued to leave a trail of destruction in his wake at the Autumn Grand Sumo Tournament as he bumped out Kyokushuzan on Sunday to remain the sole leader with a perfect 8-0 record. Kotooshu appeared nervous at the face off but faced little resistance from Kyokushuzan (4-4) and with a firm grip on his belt, he quickly worked the Mongolian maegashira to the edge of the ring before ushering him over the straw bales at Tokyo's Ryogoku Kokugikan. Kotooshu stayed one win clear of grand champion Asashoryu with a week of the 15-day tournament left to go but he sensibly played down his chances of becoming the first European to win the Emperor's Cup. "I've got a winning record now but it's far from over yet. There is still another week to go," said Kotooshu. TV sports reporters are saying that Kotooshu's perfect string of wins is the best performance by a newly promoted sekiwake since Taiho, Chiyonofuji, and other sumo greats. Tatsuo Yoshida at Asahi.com explains what's wrong with Asashoryu these days, and what's right with Kotooshu. Hint: Asa's work ethic let's him down. UPDATE, Day 13: After much hype of the big face-off between the twice-thrown yokozuna Asashoryu and the upstart Kotooshu on his 12-bout winning streak, hype that included many profiles of Kotooshu, his family in Chiba, the country of Bulgaria, and even Meiji Dairy's Bulgaria-brand yoghurt, Asashoryu managed to bust Kotooshu's winning streak, keeping his own hopes alive for winning his 6th Emperor's Cup in a row. UPDATE, Day 14: Another young upstart, Kisenosato, managed to "preserve his three losses" (３敗を守る) and hand Kotooshu a second loss, making the latter even with Asashoryu (both 12-2) going into the final day of the Aki ('Fall') Basho. I hope Kotooshu regains his confidence, preserves his two losses, and then manages to beat Asashoryu for the expected playoff on the final day. Even better would be for overconfident Asashoryu to add another loss to his total, so that Kotooshu wins the tournament outright with a record of 13-2. UPDATE, Day 15: What a disappointment! The big face off, the ketteisen 'deciding match', between Asashoryu and Kotooshu was much too short and sour (to me). It was a great tournament, though, with a lot of upsets. All the more so watching a good bit of it in real time. Just now, waiting in the wings to come out and receive the Emperor's Cup, the swaggering, puffed-up, belligerent Asa actually broke down and wept for a brief moment. Fascinating. So now he joins the great Taiho in winning 6 Emperor's Cups in a row. On July 26, 1939, the United States, having repeatedly protested Japanese actions in China, notified the Hiranuma government that it intended not to renew the U.S.-Japan Treaty of Commerce and Navigation, scheduled to lapse in January 1940. Up to that point the Roosevelt administration had pursued a policy of gentle appeasement of Japan, but its basic Asian policy had always been to maintain the imperialist status quo embodied in the Washington treaty system. Thus it had consistently refused to recognize any changes Japan had brought about by force in China. Roosevelt had also propped up China's national currency by making regular silver purchases--a policy that would eventually lead him to join the British in providing foreign exchange so that Chiang Kai-shek could stabilize his currency, counter the proliferation of Japanese military currencies in occupied areas, and go on fighting. Now, however, anticipating that war would soon break out in Europe, the United States put Japan on notice that serious economic sanctions could follow further acts of aggression. Thereafter, if Japan's leaders were to continue the war in China, they would have to take more seriously the reactions of the United States, on which they depended for vital imports needed to wage war. Even if we can purchase [oil and scrap] for the next six months, we will immediately have difficulties thereafter. Unless we reduce the size of our army and navy by one-third, we won't make it.... They [his military and naval leaders] should have prepared for something like this a long time ago. It's unacceptable for them to be making a commotion about it now." But of course Hirohito did not enjoin his chiefs of staff to end the China war, or to reduce the size of anything; he simply got angry at them for not having anticipated the American reaction. A few weeks later, on August 23, 1939, while the Japan-Soviet truce to end the fighting on the Mongolia-Manchukuo border was being negotiated in Moscow, Germany signed a nonaggression pact with its ideological enemy, the Soviet Union--which contravened the 1936 Japan-German Anti-Comintern Pact. After a fruitless three-year quest for "collective security" with the West against Germany territorial expansion in Europe, Stalin had declared Soviet neutrality and, in a secret protocol attached to the pact, made a deal with Hitler to take over the Baltic states and eventually partition Poland. Stunned by this diplomatic reversal, and unsure how to interpret the enormous strengthening of both German and Soviet power that Hitler's alliance with Stalin portended, the Hiranuma cabinet resigned on the morning of August 28. The latter half of this book seems much better than the first, probably for two reasons: (1) The documentation is far richer, so Bix doesn't have to overinterpret thinly sourced material. (2) Parts of it have been published before, so it is likely to have undergone more revision in response to referee comments. The chapter entitled "Prologue to Pearl Harbor" is excellent, but I think I'll refrain from excerpting it. A reader, John Wilmer, sent a link to a website full of long lost far outliers that immediately sucked me in. Here are a few excerpts from the introduction and translated applications for repatriation from Hawai‘i to Russia in 1917. At the beginning of the 20th century Hawaii sugar plantation owners began to recruit laborers of European background. Former Secretary of the Territory of Hawaii and Director of the Bureau of Immigration, Alatau L.C. Atkinson, and a somewhat questionable Russian entrepreneur A. V. Perelestrous, traveled to Harbin, Manchuria to recruit Russian workers, primarily from the area around Vladivostok. Perhaps as many as 2,000 Russians and Ukrainians came to Hawaii. Podrez Sergei Konstantinovich. Born Oct. 6, 1878. He was a peasant from the village of Dubki IUzhno-Ussuriisk uezda Primor'ye oblast. In Harbin he was a tailor's shop and worked as an agent for the Singer Co. In 1910 he came with his family to Hawaii. Before repatriation from Honolulu he was a construction worker on the local prison. He left Hawaii alone in 1918 after he divorced his wife Elena Ermolaevna, 33 yrs. old (she was a mid-wife). They had four daughters ages two to sixteen, and had refused to leave with him. The court in Honolulu told the husband to pay $6 wk in alimony. Kolesnichenko Demid (Dmitrii) Borisovich. Born Aug. 16, 1883 in the village of Kotliarka Kiev guberniia. In Nikol'sk-Ussuriisk he was the owner of a workshop were he considered that he "received more money for his work." (than Hawaii) He was a reserve junior non-commissioned officer in 1905. He came to Hawaii through Harbin on the ship Korea in 1910. His wife Pelageiia Nikiforovna, b. 1889 and three children from the ages of 4 to 8. Two of these were born in Honolulu. He mostly worked on sugar plantations on Oahu, but his last work was as repairman for horse-carriages ($4.75 day). He wanted to return to his parents in Nikol'sk-Ussuriisk. Trautshold noted: "drinks." Riazantsev Fedor Petrovich. Born in 1865. He was a peasant in the village of Orlovka Tifilissk guberniia. Dukhobor Minister (Svobodnik). In 1899 he finished three years of exile to Tifiliisk for publicly destroying weapons (a religious principle). After that he emigrated with his parents to Canada and lived in British Columbia. In Feb. 1917 he came to Honolulu with his family. His wife ("spiritual sister"--Dukhobors don't get married) Pelageia, b. 1872, and their two sons aged 12 and 23 yrs. old returned to San Francisco because it was difficult to find work in Hawaii. In Honolulu Fedor was a temporary worker for building the water-works ($2 day). He said to Trautshold: "I know about freedom [i.e., the revolution] in Russia, and the Dukhobors want to ask the government to give us land to settle where we can live without animals." Dec. 16, 1917 he returned to Russia. By May , when the major transport center of Hsuchou fell, the Japanese army was using chemical weapons whenever they could be effective in turning the tide in closely fought battles. "Imperial Headquarters Army Order Number 301," sealed by Hirohito on May 15, 1939, authorized the carrying out of field studies of chemical warfare along the Manchukuo-Soviet border. What the content of those studies was remains unclear. In July 1940 Hirohito approved Prince Kan'in's request to authorize the use of poison gas by the commander of the Southern China Area Army. A year later, however, in July 1941, when the army moved into the southern part of French Indochina, Army Chief of Staff Sugiyama issued a directive explicitly prohibiting the use of gas. Presumably Hirohito and the high command were concerned that gas not be used against Western nations that could retaliate in kind. Their well grounded fear of American possession (and forward stockpiling) of chemical weapons continued to deter them from using such weapons down to the end of World War II. Hirohito also sanctioned during 1940 the first experimental use of bacteriological weapons in China. It is true that no extant documents directly link him to bacteriological warfare. But as a methodical man of scientific bent, and a person who questioned what he did not clearly understand and refused to put his seal on orders without first examining them, he was probably aware of the meaning of the orders he approved. Detailed "directives" of the Imperial Headquarters that the army chief of staff issued to the Kwantung Army command in charge of biological warfare, Unit 731, were as a rule shown to the emperor; and the Army Orders of the Imperial Headquarters--Army, on which such directives were based, were always read by him. Biological weapons continued to be used by Japan in China until 1942, but the full consequences of this Japanese reliance on both chemical and biological warfare would come only after World War II: first, in the Truman administration's investment in a large biological and chemical warfare program, based partly on transferred Japanese BC discoveries and technology; second, in the massive American use of chemical weapons in Vietnam. Though no documents directly tie him to it, another feature of the brutal Chinese war for which Hirohito should be charged with individual responsibility was the strategic bombing of Chungking and other cities, carried out independently of any ground offensives, and using many types of antipersonnel explosives. Starting in May 1938 and continuing until the beginning of the Pacific War, the Japanese naval air force initiated indiscriminate bombing against China's wartime capital of Chungking and other large cities. The bombing campaign was uncoordinated with the army's strategic bombing of Chinese cities. First studied by military historian Maeda Tetsuo, the navy's air attacks on Chungking anticipated the German and Italian bombing of cities and strategic bombing of Japan's own cities that the United States initiated during the last stage of the Pacific War. At the outset the navy deployed seventy-two bombers (each with a seven-man crew) and dropped incendiary as well as conventional bombs. In their first two days of raids, they reportedly killed more than five thousand Chinese noncombatants and caused enormous damage. Two months later, in retaliation for this indiscriminate bombing, the United States embargoed the export of airplane parts, in effect imposing its first economic sanctions against Japan. The aerial bombing of Guernica took place on 26 April 1937, almost exactly a year before the first Japanese bombing of Chungking. Jonathan Dresner at Frog in a Well has a nice summary of how effective Japan's Postal Savings system has been since it was first created back in the Meiji era. The Postal Savings system was a fundamental institution in the Meiji modernization, enabling reliable low-cost long-distance transactions (including remittances from overseas, which is where my research comes in) and accumulating small deposits into a pool of capital that was agressively used for investment in railroads and other heavy industrial development. I know I've been relying on the post office ATMs while I've been in Japan these past six weeks, since a lot of combini don't give equal access to accounts overseas. My first comment on the recent election is that it provided me a great opportunity for language-learning that kept listening and reading skills in synch. The constant repetition of restricted sets of visual and oral clues with each new set of results (enough to keep me watching) gave me time to look stuff up in my handy-dandy new Canon WordTank: 当選の当 (short for 'elected')、確実の確 (short for 'called')、比例の比 (short for 'proportion[ally elected]')、圧勝 ('pressure=overwhelming victory')、plus a lot of surnames and placenames that I'm always a little shaky on. Two more points: (1) Koizumi seems to be creating the equivalent of Blair's New Labour or Clinton's DLC (which is where I feel most comfortable on the political spectrum). Can we call the current LDP the New Tories? (Please, not Neocons!) (2) The DJP really got wiped out in Greater Kanto. I'm right now in Ashikaga, on the border of Tochigi and Gunma, where all but one out of maybe 18 wards went for the LDP. You can see the economic growth (industrial parks, tract housing, strip malls, big box retailers, lots of cars and parking) all around the edges of the Kanto plain. This summer, the major Japanese brewers have all been pushing their new "third beer" products. I was motivated to sample them by the relative price--about ¥600 for a six-pack, as opposed to at least ¥1200 for malt beer. The "third beer" boom was sparked by Sapporo, which launched a beverage called Draft One in February 2004. Made with protein extracted from peas, Draft One's selling point is its light taste and drinkability. Meanwhile, Kirin's Nodogoshi Nama, made with soybean protein, touts its good flavor and crispness. Asahi's Shin Nama, which uses soy peptide and a yeast that the company also employs in beer making, offers a dry finish. And Suntory's Super Blue, which contains low-malt beer mixed with liquor distilled from wheat, has a crisp, refreshing taste. Determined to avoid the high taxes imposed on beverages made using malt as a raw ingredient, the brewers went to a lot of trouble to find alternatives. Sapporo, the pioneer in this market, experimented for four years with a series of ingredients that included two types of millet and corn before hitting on pea protein as a raw ingredient. 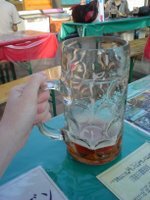 I've now sampled all of the above-listed "third beers"--plus Sapporo's new low-calorie, "high fiber" Slims--and the only six-packs I could finish were Sapporo's Draft One and Asahi's Shin Nama. And if the weather hadn't been so hot and muggy, I'm not sure I could have accomplished even that much. Now I guess I'll have to sample a couple of Japan's "second beers"--the low-malt happoshu. But, except in really hot weather, I prefer my beers flat, dark, and bitter, not sudsy, pale, and yeasty. I could drink Guinness for breakfast, lunch, and dinner if I never had to get any work done. At the imperial conferences Hirohito presided over and approved decisions impacting not only the destiny of Japan but of China and other countries affected by Japanese policy. Since these conferences were usually convened after the liaison conferences [between the top government and military leaders], at which all the interested parties had reached decisions in which the emperor shared [passively or actively?--J. ], he already knew the contents of the matters to be "decided." Essentially the imperial conference was designed to allow him to perform as if he were a pure constitutional monarch, sanctioning matters only in accordance with his advisers' advice but not bearing responsibility for his action [so in this context "sanctioning" = rubberstamping--J.]. At these meetings, civilian ministers wore morning clothes and military officers full-dress uniforms. The theatrical element of these affairs should not obscure their great importance, however. Nor were all imperial conferences the same, and the emperor's lips were not sealed at all of them [so they *were* sealed at most of them?--J.]. Look, I have no interest in excusing Hirohito for his manifest sins of omission, and am fully prepared to believe that he exercised malignant leadership on many occasions. (Nor do I care one way or the other whether the Japanese imperial throne is preserved or abolished.) But I just find Bix's arguments to be more tendentious than convincing when he tries to make the case that Hirohito was a more active than passive sinner. POSTELECTION AFTERTHOUGHT: It's interesting how much criticism newly (and overwhelmingly) reaffirmed Prime Minister Koizumi gets for *not* making decisions in the unaccountable backroom manner described above, which has long characterized Japanese politics. Tensions in Shanghai had begun after Japanese residents took umbrage at a Chinese newspaper article, on January 9, decrying the failure of the assassination attempt on the Shôwa emperor. Nine days later army Maj. Tanaka Ryûkichi, hoping to divert foreign attention from the army's operations in northern Manchuria, instigated an attack by a Chinese mob on a group of Japanese Nichiren priests. The Imperial Navy found this incident a tempting chance to demonstrate its prowess to the army. The Shanghai fleet was quickly reinforced and on January 28, 1932, marines under Rear Adm. Shiozawa Kôichi went ashore and that night challenged China's Nineteenth Route Army--a 33,500-man force stationed in the vicinity of the International Settlement, which ran along the waterfront. In the ensuing battle the Chinese gave the Japanese marines a good thrashing. Unable to retrieve the situation despite reinforcements from the fleet, the navy had to call on the army for help. But the Chinese army still held firm and again inflicted heavy losses. The high command in Tokyo then organized a full-fledged Shanghai Expeditionary Force under General Shirakawa and reinforced it with two full divisions. Intense fighting ensued; the Chinese finally fell back, and Japan was able to announce a face-saving cease-fire, followed by an armistice, negotiated with British participation on May 5, 1932, which also ended the Chinese boycott. The Shanghai Incident should have awakened Hirohito to the recklessness and aggressiveness of his senior admirals--the very officers he and the court group regarded as sophisticated, cosmopolitan men of the world. Driven by service rivalry, they had deliberately sought a confrontation with Chinese forces in the heartland of China, knowing that problems with the United States and Britain were sure to result. Equally important, this incident was an unlearned lesson for both military services. Neither army nor navy drew any new conclusions from the heavy losses they incurred in this first large battle with a modern Chinese army. They continued as before--utterly contemptuous of the Chinese military and people, whom they saw as a rabble of ignorant, hungry peasants, lacking racial or national consciousness, that could easily be vanquished by one really hard blow. Hirohito himself may have held that view privately. But the emperor was more aware than his commanders of Japan's vulnerability to economic blockade. Going out of his way, he told Shirakawa to settle the Shanghai fighting quickly and return to Japan. At Shanghai, Hirohito acted decisively to control events; in rural Manchuria, on the other hand, he was pleased to watch passively as his empire expanded. So much for the conventional wisdom that the Imperial Japanese Navy was much less inclined toward war than the Imperial Japanese Army. On March 24, 1927, soldiers of China's Nationalist Revolutionary Army pillaged the Japanese Consulate in Nanking and assaulted the consul; they also attacked buildings housing the American and British Consulates. Later that same day British and American warships on the Yangtze River bombarded the city. The Japanese press immediately sensationalized the Nanking Incident, in which six Westerners died, Japanese rights were violated, and no Japanese troops had been dispatched. Against this background, in the middle of the official mourning period for the Taishô emperor, Hirohito sanctioned Japan's first military interventions in China's civil war. Twice, on May 28 and July 8, he gave his consent to the army's dispatch of troops to China's Shantung Province, ostensibly to protect Japanese residents from assaults by Kuomintang soldiers on their way north toward Peking. Less than a year later, on April 19, 1928, he consented to another deployment: this time five thousand troops of the Sixth Division, under Gen. Fukuda Hikosuke, to the port of Tsingtao, Shantung, a center of Japanese textile capital and once a Japanese protectorate. He did so after first asking Chief Military Aide Nara whether the intervention would lead to another massacre of Japanese lives such as had occurred in the Russian city of Nikolaevsk (now Pugachev) in 1920. Nara said that it would not. When Gen. Fukuda arrived in Tsingtao, however, he decided on his own initiative immediately to proceed inland (by rail) to Tsinan. There, a few days later, the first of several clashes occurred between Japanese and Nationalist soldiers. Later, on May 8, Hirohito sanctioned without hesitation the dispatch of reinforcements to Tsinan. The Tsinan affair dragged on into early 1929, during which time seventeen thousand Japanese troops unleashed a reign of terror on the Chinese citizens of the city, wrecking chances for Sino-Japanese rapprochement. For Hirohito this incident was yet another example of Tanaka's inadequacy as a prime minister. Less than a month after Hirohito had sanctioned a fourth deployment of troops to Shantung Province, on June 4, 1928, senior staff officers of Japan's Kwantung Army, led by Col. Kômoto Daisaku, assassinated the Chinese warlord and territorial sovereign, Chang Tso-lin, on whom Prime Minister Tanaka had based his Manchurian policy. This incident (and the prime minister's alleged mishandling of it) pulled Manchuria into the turmoil of Japanese and international politics. For the young emperor and his entourage, it provided the opportunity they had long been seeking to remove Tanaka and his entire Seiyûkai cabinet. Notice the verbs (which I've boldfaced) that Bix uses to describe Hirohito's 'actions'. He sanctioned and consented, and once even asked a question before consenting. Sanctioned is one of those verbs that can mean anything from 'strongly advocated' at one extreme, to 'rubberstamped' at the other. It is by far the most common 'action' that Bix attributes to Hirohito during his involvement in key decisionmaking. In most cases, Bix is reduced to accusing the emperor not of acting wrongly, but of failing to act--more specifically, of failing to rein in a military that was out of control by calling for the punishment of criminal behavior by its officers. Note the unsanctioned actions of Gen. Fukuda and the Kwantung Army officers, which I've italicized in the passage cited above. Despite Bix's repeated, often tendentious, explications of the silent emperor's thought processes and intentions at each indirectly documented event, Hirohito never seems to be the initiator of any military action. Instead, he comes across as an irresolute, squeaky nag on his ceremonial white steed, who on nearly every occasion accepts the recommendations of his advisors. His most aggressive actions seem to be directed at civilians, when he dissolves the cabinets of unsuccessful prime ministers. Meanwhile, the military literally gets away with murder. Instead of a commander-in-chief, Hirohito acts more like a nagging national mother-in-law to each new prime minister. On the other hand, Bix does a thorough and convincing job of answering the question, "What did the emperor know and when did he know it?" Hirohito was well informed about all key events. And Bix's narrative also recaps clearly the step-by-step road to war between Japan and the U.S., countering two prevalent myths along the way: (1) That the U.S. pushed Japan into war while Japan was willing to compromise. In truth, every escalation of U.S. sanctions was in response to new levels of Japanese aggression in China, and Japanese refusal to compromise on China. (2) That Chiang Kai-shek's army saved its ammo while Mao's communists bore the brunt of the anti-Japanese resistance. If anything, it was the reverse during the 1920s and 1930s. The Nationalist army fought well against the Japanese in a number of earlier engagements, even besting them on occasion. If China had had an air force that could bombard the Japanese homeland the way the Japanese bombarded Chinese cities, it might at least have fought Japan to a draw. At least those are my impressions after reading the first half of Bix's tome. One day last weekend, an early morning walk turned into a full morning's hike along mountain trails near our apartment. 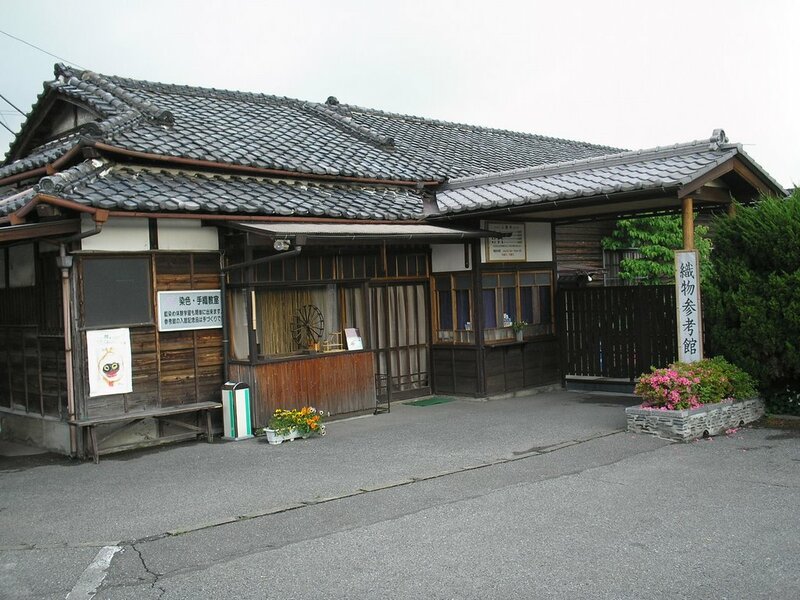 We started at Ashikaga's Orihime Jinja, a textile industry shrine established in 1937. FIRST DETOUR: Orihime is 織姫 'weaving princess'; textiles are orimono 織物 'woven things'. Orihime is the heroine of the Tanabata story. "The legend was probably imported from China in the Heian Era (794-1185), and its associated Tanabata Festival has developed through the centuries. The story involves the stars of Vega and Altair and their apparent proximity to the Milky Way." Although July 7 marks Tanabata in much of Japan, Ashikaga and other northern cities follow Sendai in celebrating it on August 6-8. "I saw two inoshishi," she said, "They were so cute. Don't worry. They're used to people and won't attack." "What do they eat?" I asked. "They live on fresh roots, fallen fruit, and the food left on graves." SECOND MEANDER: Sure enough, a few days later, we saw another sign warning about inoshishi, this time at Hôrakuji (1294), a temple that served as a model for the much more famous Ginkakuji (1460) in Kyoto, both built by Ashikaga clan leaders, as was the more spectacular Kinkakuji (1397). It asked people not to put food on the graves in the large cemetery behind the temple that climbed halfway up the same hillside we had hiked. We thanked the lady for her advice and set out on a well-traveled trail. We never saw any inoshishi, nor did the other people we queried as they were returning. 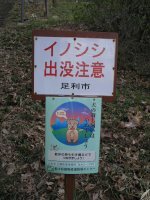 But once we got to the shrine at the top and decided to take a less travelled path back, we began to see constant signs of pigs rooting beside the trail. We never saw--nor even heard--the pigs themselves, but when the path turned out to be a little less well beaten than we had hoped, we were sometimes heartened to see that at least the pigs recognized it as a human thoroughfare likely to attract the odd bit of food waste. Near the end of the mountain trail, as we slowly approached civilization by way of overgrown cart trails past overgrown vegetable gardens, we even saw a real pig wallow at a bend in the road, with the water still murky from recent use. It's good to see that even larger Japanese animals are making a comeback, even if they do make pests of themselves from time to time. 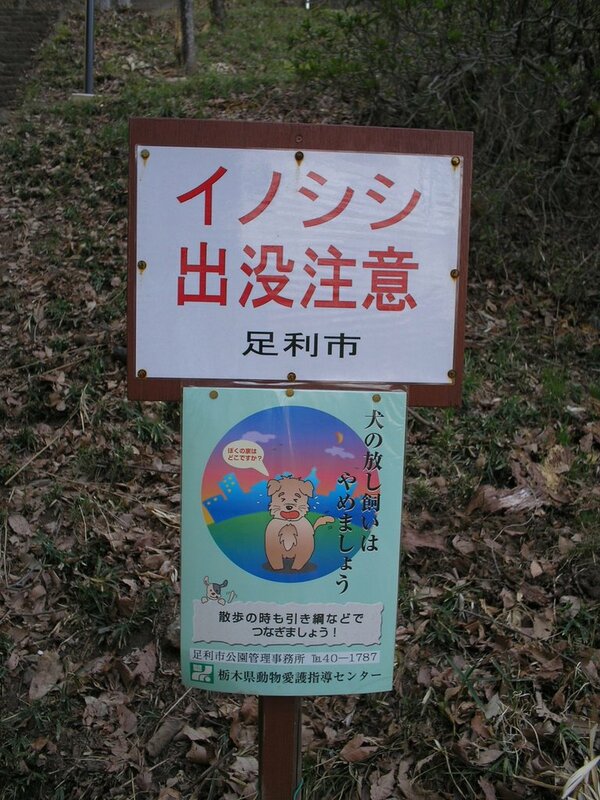 FINAL TRAIL OFF: According to an abstract in PubMed, there are two subspecies of wild pig in Japan, Sus scrofa leucomystax and S.s. riukiuanus (the latter from the Ryukyus), both more closely related to the Far Eastern (S.s. ussuricus) than to the Middle Asian (S.s. nigripes), Transcaucasian (S.s. attila) and European pigs (S.s. ferus). Seeking to resist the democratic current and build up the waning imperial authority, on November 10, 1923, the Kiyoura cabinet adopted a "cultural policy" based on the regent's [i.e., Crown Prince Hirohito's] Imperial Rescript on the Promotion of the National Spirit. Prime Minister Kiyoura thereupon formed, in February 1924, a Central Association of Cultural Bodies in response to Hirohito's call for the improvement of thought and "the awakening of the national spirit." Invited to the association's convocation meeting to discuss a national campaign against "dangerous thoughts" associated with the labor movement and the Left were representatives from Shinto, Christianity, and Buddhism, including the leaders of Nichiren. The sect, founded in the thirteenth century, was enjoying its golden age of influence and growth, and two of its leading proseltyzers--Honda Nisshô and Tanaka Chigaku--immediately seized upon this "national spirit" campaign to draw up an appeal asking the court to issue a rescript conferring on Nichiren, the founder of their religion, the posthumous title of "Great Teacher Who Established the Truth," so that they could then use it for prosletyzing purposes. After the court granted Nichiren the title, Imperial Household Minister Makino is alleged to have declared: "This decision was due to the emperor's benevolent awareness that the present ideological situation in Japan requires better guidance by sound thought, and especially, firm religious belief." In fact the imperial house, controlled by Makino and Hirohito, awarded the title because it considered the social situation bad enough to warrant the services of the most passionate enemies of Taishô democracy, the Nichiren believers. When Honda went to the Imperial Household Ministry to receive the award, he met Makino and told him that the Nichiren religion "is the banner of an army on the offensive in the 'ideological warfare' of the present day." Honda also expressed his patriotism and boasted about the Nichiren sect's antidemocratic, anticommunist nature." That Buddhism (or the faith of Nichiren believers, many of whom were upper-echelon military officers and civilian right-wing ideologues) had to be called on to supplement emperor ideology indicates that the official creed was never able to exercise a controlling influence on all groups in Japanese society. Guidance: Welcome it is all of you! The following sign at Shin Sapporo Station Bus Terminal no. 22 was helpful and befuddling at the same time. A visitor going to "a village of reclamation" takes a bus for "Kaitaku no mura" of the 22nd number from a departure home of here and please take it to a terminal. Because I can be more late by traffic circumstances from the departure time, please understand it. Then please spend pleasant time. In addition to the issue of repatriation, our leaders also accused the American side of some other serious violations of the [Geneva] convention. To be fair, I didn't feel that our captors treated us badly. At least we were sheltered and had food. Most of the wounded prisoners had access to medical treatment, though conditions still had room for improvement. About six thousand people had been crowded into a small compound, with no disease springing up, because sanitation had been adequately maintained. Some inmates had even gained a little healthy color, especially some cooks whose cheeks had grown thicker. We often joked that the latrines in the compound were better equipped than those in our barracks back in China. Seats had been installed in them, and at the centers of the rooms were washing facilities--faucets for running water and metal basins set into round concrete tables. On the whole, I had to admit that the Americans were generous, at least materially. Besides food, each POW was given at least one pack of cigarettes a week, and sometimes two packs. I saw with my own eyes that American medical personnel treated injured civilians at the Pusan prison hospital. Here in every compound the United Nations had set up a program for civilian education that distributed books among the inmates, offered courses in mechanics, science, and Christianity, and often showed movies. Unfortunately our compound, controlled by the Communists, wouldn't have anything to do with such a program. Whenever a prisoner reported that he had lost his blanket or mat, he would be issued another one, since there was always a surplus of these things within the compound. Sometimes this would even apply to uniforms. Such replenishment was unthinkable in our own army, in which you would be disciplined for the loss. Back in China I had never heard of a soldier losing his bedroll. [Chinese POW leader] Chaolin had a sharp tongue. The moment the [American] major finished reading [the Geneva Convention booklet], Chaolin said, "Obviously our treatment falls short of the standard set by the convention. For example, we Chinese don't eat barley, which is fed to livestock back home. But you have made barley the staple of our diet, and most of the time there isn't enough barley for everyone. Each man can have only two bowls a day, and the calories are way below the minimum need of the body. What's worse, there's very little vegetable in our diet, and meat is absolutely a rarity. If your country has difficulties, please notify our country. I'm sure China will send over shiploads of rice, meat, and eggs to keep us from starving. What he had said about barley wasn't wasn't true. No Chinese would feed animals barley, which we didn't like as much as rice but which tasted better than corn or sorghum, the principal foodstuffs in northern China. Having heard my translation, General Bell reddened and said, "I will take your unusual Chinese dietary habits into consideration and try to solve this problem. If you always feel hungry, I suggest that you stop the hunger strike now, which will increase your fellow men's misery and waste food. As for the medical conditions, I will see what I can do."